The country’s biggest ever mass-action environmental campaign starts tomorrow! Be a part of history as 500,000 #LitterHeroes prepare to take action and clean up the litter pollution - that degrades the beauty of our environment and threatens to harm wildlife - from our streets, parks and beaches. CIWM’s ‘Cleaner Communities’ day will inform local authorities and the private sector on current hot topics within the street cleansing sector. The day will adopt a relaxed approach, with seminars focusing on procurement, data and fly-tipping. This niche event, specifically tailored for like-minded resource and waste management professionals, is the perfect opportunity to network with key decision makers involved in the world of street cleansing. The event is free to attend and lunch is provided. View the full programme or book your place. To prevent or reduce marine litter impacting on UK coastal and marine environments and / or species. Approximately 60% of this funding will support projects in Scotland with 40% going elsewhere in UK. Evaluation criteria will be the same as for our main grant fund. To apply, groups can visit our website (http://www.sea-changers.org.uk/charities) and download the application and funding policy to check they are eligible. The Aviva Community Fund will finance over 500 projects and funding is available for projects of all sizes ranging from £1,000 up to £25,000. To make sure every cause has a fair shot, each entry must meet the criteria. The project must relate to a non-profit organisation based in the UK and has an average annual gross income of less than £1,000,000 over the last 3 years (or £100,000 when applying for the £1,000 Award). Don’t fit the criteria? Why not share this opportunity with a cause that might! Health and Wellbeing - This is the category for any project for any age group linked to physical or mental health, sport, outdoor pursuits. Skills for Life - These projects aim to help local communities and individuals improve their lives by learning useful new skills, particularly digital ones. Community support - This category aims to help communities make their surroundings and aspects of their life sustainable. From regeneration projects to local support groups, this category offers support for anything that is important to your community. Inclusivity - The Inclusivity category is for projects that bring people together, no matter what their faith, colour, gender, abilities or sexual orientation. The first 200 entries in the £1,000 category to reach 1,000 votes automatically win funding (subject to due diligence). After that, 180 top-voted entries at the end of voting in the £1,000 category will receive funding. The top-voted entries in the £5,000, £10,000 and £25,000 will go through to judging. Your project will need as many votes as possible to get through to the finals. The louder and longer you drum up support in the community, the better! This is your chance to make a massive difference to your charity and your community. Together we can make a difference. This award is designed for those individual groups, and organisations that are not local authorities (such as community groups, resident clean ups and Business Improvement Districts (BIDs)), who have had a positive effect on local environmental quality over the past 12 months. The day will adopt a relaxed approach, with bitesize workshop sessions, case studies, examples of best practice and a chance to engage with a range of sector leading companies who will be exhibiting their services. The event is a great opportunity for facilities managers, street scene managers, municipal vehicle operators, Business Improvement Districts (BIDs), procurement managers and more to come together and make the community a cleaner and safer place. The Great British Spring Clean, which takes place up and down the UK from the 3rd – 5th March 2017 is set to be the nation’s biggest ever anti-litter campaign, inspiring 500,000 people across the UK to get out into their local community, clean up litter and ensure their neighbourhood is one of which they can be proud. The Great British Spring Clean is endeavouring to build on the success of the 2016 national clean-up, which saw 250,000 people take part. This year’s aim is to encourage half a million litter pickers out onto the streets, parks and beaches of Britain, not only to help clean up the country but to demonstrate their desire to see action taken to put a stop to littering and the economic and environmental damage it causes. We spend £700 million every year cleaning our streets and data from the RSPCA reveals that there are 5,000 reports of animals being injured by litter each year, including swans, gulls and foxes. As a result, the campaign has won the backing of TV naturalist and writer Steve Backshall, the BAFTA-winning Deadly 60 presenter. The campaign is being delivered through a broad range of partners including the RSPCA, the Marine Conservation Society and Keep Wales Tidy together with businesses including McDonald’s, Greggs, Costa, Harrogate Spring Water, The Helping Hand Company, a wide range of schools, local authorities and MPs across the UK. I wondered if I was tiny, what I might find? A bumble bee shouted for her to get back! For fear it was some swooping bird, coming down to eat him whole! This is a three year young people's project to tackle the litter problem. Conventional anti-litter methods are not working so creative and innovative ways of raising awareness and encouraging collective responsibility are necessary. Inspired by Griff Rhys Jones who adopted the moniker Griff the Garbage, to help Rob the Rubbish clear Snowdon of its trash, Ann Palmer, who is based in the Outer Hebrides and whose pen name is Gaia Dance, chose her own moniker – Gaia the Garbage. Ann found an abandoned toy telephone on the beach. Her husband Peter took a picture of her with the telephone, and they captioned it Hotline to kids. This seeded the idea of a Children's Humorously Captioned Photography Competition, which is now, in 2017, in its third year. This is a final reminder that the Western Riverside Environmental Fund (WREF) is offering grants of £5,000 - £20,000 for projects that work with local communities to promote environmental improvements in the London Boroughs of: Hammersmith & Fulham, Kensington & Chelsea, Lambeth, and Wandsworth. There are just 3 weeks left to apply. Please do pass this opportunity on to any other groups you feel may be interested. Coffee capsules have been taking hard hits in recent times, from a "Kill the K-Cup" video that went viral on Youtube last year to remarks by John Sylvan, one of the founders of Keurig's K-Cup, expressing remorse at ever having invented the now ubiquitous coffee pod. "Capsule-coffee is expensive and the pods don't have a good ecological balance sheet," said Jan Dube, media spokesperson for the Ministry of the Environment and Energy. "They have lots of packaging compared to the small amount of coffee and we just decided we don't want to buy those products anymore with public money." According to Dube, total consumption in 2014 in Germany was roughly three billion coffee capsules, which is estimated to equate to about 64 million pods consumed by Hamburg's 1.75 million inhabitants. The number is concerning, said Dube, because the capsules' composition of plastic and aluminum is so hard to recycle. There is also a lot of packaging for just a little bit of coffee. Dube estimates that there are roughly three grams of packaging for every six grams of coffee. Diane Duperret, a spokeswoman for Nespresso, said Hamburg's environmental guidelines "highlighted the need to move towards a more sustainable society." "Nespresso agrees with this principle," she added. And while it may be coffee pods getting most of the scrutiny as of late, Hamburg's ban is far from limited to these. The list of banned items includes many other sources of environmental pollution, including plastic water bottles, disposable cutlery, paint containing biocides, and chlorinated cleaning products. Hamburg also plans to increase the number of electric vehicles in the city's fleet. The abundance of attention given to coffee — instead of plastic forks, for example — may have something to do with George Clooney and Matt Damon, two personalities well known in Europe for their appearances in Nespresso ads. "The coffee is maybe less abstract than other products," said Dube. "It's a product everyone knows, with celebrities doing ad campaigns for the capsules." Though other cities in Germany have taken progressive measures when it comes to the environment, Hamburg is the first to go this far. The new environmental guidelines, passed in January and published in the form of a 150-page text, are the result of years of work. "We prepared these guidelines and the details for several years within the administration," said Dube. "The main aim was to use this purchasing power of the city administration — of more than 250 million euros per year — to give better chances to ecologically friendly products and not to environmentally harmful products." As Senator for the Environment Jens Kerstan explained in a press release, "From now on, mandatory environmental criteria such as raw material consumption, durability, and transport distances will play an even more important role in purchasing decisions. It sends out an important signal to business and private individuals, encouraging them likewise to take greater account of the consequences of their purchasing decisions and to pay attention to each product's history." Duperret said Nespresso is pursuing ways to increase the amount of coffee capsules that end up in recycling centers rather than a landfill. "We continue to look at new ways to further reduce the impact of our products," she said. "Upping recycling rates is a clear priority. We have dedicated recycling systems in place in 31 countries and in some our used capsules can be recycled through national waste recovery systems." As for Keurig, the company's vice president of corporate communications, Suzanne DuLong, notes that Keurig brewers and K-cup pods are not currently sold in Germany. She also stressed in an email that the company is working hard to become more eco-friendly. According to DuLong, "Keurig offers several recyclable pod formats today; a reusable My K-Cup cartridge which enables consumers to brew any coffee they choose in their Keurig brewer; and, pod take-back programs for our office customers. We're not stopping there however. The recyclability of our K-Cup pods is an issue we take very seriously and while it's a complex challenge involving pod material selection and collaboration with recycling and plastic industry experts, we have a stated goal to have 100% of our K-Cup pods be recyclable by 2020, with an increasing number of pods converted to a recyclable format each year between now and then." Though the new guidelines in Hamburg apply only to city government buildings and public institutions, the city is hoping the emphasis on ecology will prove contagious — both within city limits and beyond. So far, reactions to the new guidelines have gotten an overwhelmingly positive response, with some cities expressing interest and asking questions about how they can implement similar regulations, said Dube. "We don't want to overestimate the role of Hamburg, but if others follow our example and introduce similar guidelines, we would be happy about it." World Oceans Day is Wednesday, June 8th! This year, individuals and organisations across our blue planet are celebrating with the theme “Healthy Oceans, Healthy Planet” and are promoting the prevention of plastic ocean pollution, and other conservation actions through a variety of celebrations. Head over to the NEW www.WorldOceansDay.org site to register or find an event near you. Register your event to let the world know how you’re celebrating and gain media interest. Take a look at the world map to see all of the amazing celebrations happening around the world and find an event in your area. This World Oceans Day, join Jack Johnson and take the Wave For Change challenge. The Wave for Change is a simple campaign that asks participants to record a video of themselves making a commitment to protect the ocean, doing the wave, and sharing the wave on social media! Each person's wave will be added to a network of other people doing the wave to help our ocean. Find out more about the Wave for Change. This film aims to inspire other communities to make a difference for their local seas and seabeds. It shows a few of the cool things which can be found in UK waters, and gives some very good reasons to take action to protect them, so that our kids can find them long into the future. "As you consider your litter-picking calendar for the year ahead, why not organise a litter-picking event in support of the Clean for the Queen campaign? It’s encouraging everyone – not just the litter stalwarts in our LitterAction community - to get outside and clear up local areas in honour of the Queen’s 90th birthday. The campaign is focusing on the weekend of 4th to 6th March 2016 but, if that doesn’t suit you, events can be held at any other time. You can find out more here - www.greatbritishspringclean.org.uk – and there should be campaign posters and other materials due soon." Could you be a Clean Britain National Community Winner? There’s less than 1 month to go to enter the National Clean Britain Community Awards and be in with the chance to be crowned a litter hero. Now in its 26th year the prestigious Clean Britain awards provides a great opportunity to showcase the fantastic work you are doing in your area, share your success and receive some great press coverage and recognition in the process. Whether you have transformed a neglected area in your community, organised a successful community clean up or have inspired community pride, then our National Community Awards are for you. If you are involved in a local initiative to help keep Britain clean or caring for your local community environment then enter for free today. All you need to do is fill in an application form telling us about the work you’ve been doing in your area and we’ll select a winner from our shortlist. All finalists will receive an invitation for two people to attend the awards ceremony with lunch on the 17 November in Birmingham and entry to the Streetscene exhibition. The overall winner will receive £350 RRP Handicart ‘Go Anywhere’ Litter Collection System (pictured right) courtesy of our official sponsors Helping Hand Environmental. Click here to download an application. The closing date for entries is 5.00pm, Friday 25 September 2015. For more information and to receive an award application form please email kent@ciwm.co.uk or call 01604 823338. More than half the time what people say after littering does not match what they do, according to decades of research spun into a delightful new book by Melbourne behavioural psychologists Karen Spehr and Rob Curnow. In Litter-ology: Understanding Littering and the Secrets to Clean Public Places the authors rely on data borne from independent observations of individual disposal habits by one trained team member followed by impartial, ‘blind’ interviews by a second. “We found that of those people who’d just littered, 60% did not admit to littering that day,” they write. “One of our most robust findings has been that what people tell you about their disposal behaviour is not a very reliable indicator of their observable actions.” Litter-ology is an invaluable litter prevention guide shaped by the pair’s 20 years of scientific studying littering behaviours in Australia. If you are involved in a local initiative to help keep Britain clean or caring for your local community environment then we want to hear from you! The closing date for entries is 5.00pm, Friday 25 September 2015. Help us spread the word about the awards, if you know an individual or group that has done some fantastic work then please pass this email on to them. The awards are open to all ages and no activity is too big or too small. For more information and to receive an award application form please email kent@ciwm.co.uk or call 01604 823338. Click here to go to the website and nominate now. DSC Social Change Awards celebrate the passionate individuals and organisations committed to making a positive impact in society. You don't have to be a charity to apply. Whether you're applying as an individual, an informal group, a company, a public body or a charity; If you are passionate about social change then there is a category for you. The nomination period is open until Monday 6th July 2015 so hurry and get your nominations in now. The event will take place on 3rd December 2015 in London (venue to be confirmed). An exclusive, fun and informal event with inspiring speakers, celebrating great stories from entrants. You can nominate yourself or others (individuals and organisations) - a simple process which can be completed in less than 15 minutes. DSC will produce a shortlist of nominees, three from each category which will be posted online for a public vote where you get to pick the winners. The three shortlisted organisations and individuals in each category receive a unique and personalised cartoon by Grizelda (Check out her work here). Click here to nominate now! Closes on 6th July! World Oceans Day is next week - thanks for celebrating with us! The 8th is just a week away! We hope you’re planning a special activity or celebration on or around June 8th, or will mark the day in some special way. It’s exciting how this global celebration continues to grow each year, especially since 2008 when the United Nations officially recognized June 8th as World Oceans Day. This year’s celebration promises to be better and more impactful than ever with hundreds of events in dozens of countries that will engage tens of thousands onsite and many hundreds of thousands online. Use any and all of the materials on World Oceans Day website – we’ve developed all of this for our partners and friends around the world to use as you wish. Take the Better Bag Challenge – see if you can go disposable plastic bag-free for a year! Get the new World Oceans Day t-shirt – share the World Oceans Day message while also helping us support more community organizers around the world. Wear your love for our planet's blue heart on your sleeve with a World Oceans Day t shirt! Also, a special shout-out to our supporting partners and friends, who help make all of this possible! Have a great World Oceans Day – whether you celebrate the day, the weekend, the week, or the month – and we look forward to collaborating with you throughout the rest of the year to help take action for a healthier ocean and a healthier planet. Not sure what to do for World Oceans Day? Here are 10 ideas that you can start right now. Learning doesn’t have to happen inside the classroom. Here are 7 ways to connect kids everywhere to the ocean. Does your community officially recognize June 8th as World Oceans Day? Check out this organizing guide and campaign to make this day official in your town, state, or province. World Oceans Day is a great opportunity to get your faith community involved with ocean protection. Here are a few ideas to get you started this June. Divers have a unique relationship with the ocean. Here are 7 ways you can share your passion for World Oceans Day. Copyright © 2015 The Ocean Project, All rights reserved. With local authority spending and budgets being reduced there has never been more of a need to find alternative ways to achieve service standards than now. The first of our Clean Britain workshops will therefore look at how local authorities can succeed through collaboration with community groups and high street brands. Hear speakers from McDonald's, Wrigley, CleanupUk, Dorset Devils and Bournemouth Borough Council talking about their successful collaborations. Cherry Lewis-Taylor, McDonald's franchisee – Cherry will be talking about the first ever county-wide litter campaign which involved partnership working with councils, businesses and others. This unique approach promoted anti-litter messaging backed up by enforcement to raise awareness of litter and the risk of fines for those that offend. Alex Webb and Dan Guthrie, Wrigley – on the ‘Charity Litter Bin’ initiative involving Keep Britain Tidy and Rochford Council which saw a 42% reduction in litter in Rayleigh where the project was based. Peter Ryan, Group Coordinator at Dorset Devils – Ryan will be talking about the partnership between Bournemouth Borough Council and the Dorset Devils who are a group of local residents who volunteer their free time to clear litter from their neighbourhood and beautiful beaches. This is a packed programme guaranteed to generate some lively debates and a must-attend for local authorities looking to share best practice within the area of streetscene. This is a free event but spaces are limited so book early to avoid disappointment. For further information contact Kent on kent@ciwm.co.uk or call 01604 823338. Are you part of Clean Britain? Clean Britain supports and recognises the work of community groups and local authority street scene teams in keeping our public places and spaces clean and safe, for everyone to enjoy. By joining up to the scheme community groups and volunteers can receive a variety of benefits including a monthly Clean Britain newsletter packed full of street scene news and case studies, Clean Britain toolkits and entry to the Streetscene 2015 exhibition. The Clean Britain Community Awards provide a great opportunity to showcase the fantastic work community groups and volunteers are doing in their area and this year in addition to the National Community Award there are now monthly Community Awards which feature kit prizes. 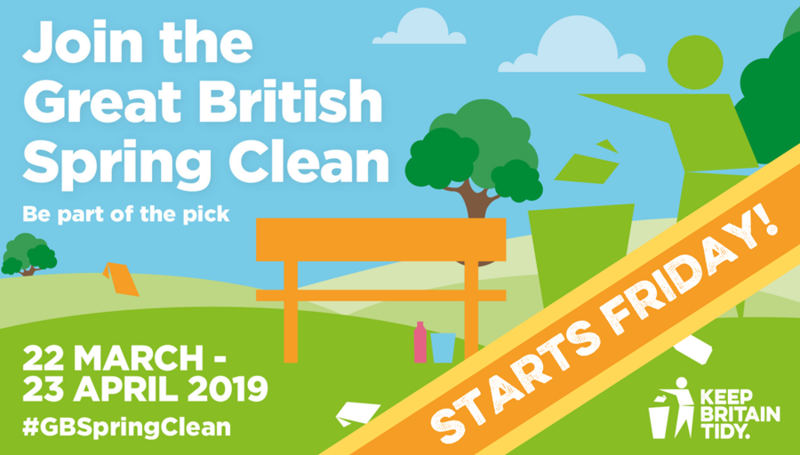 More information and details on how to sign up for the scheme can be found at www.cleanbritainawards.co.uk or you can call Kent Love on 01604 823338. The Marine Conservation Society (MCS) has launched the results of its Great British Beach Clean, which took place from 19th – 22nd September 2014. A record number of more than 5,300 volunteers took part, across more than 300 events nationally. You can download the report from the MCS website here: www.mcsuk.org/beachwatch. If you would like a copy of the associated press release, please contact Laura Foster, Pollution Programme Manager, on laura.foster@mcsuk.org. In 2013, recorded beach litter levels across the UK reached their highest point for 20 years. Sadly, this worrying trend has continued in 2014. Across the UK, more than 2,457 pieces of litter were recorded for every kilometre cleaned, representing an increase of 6% on 2013. Overall, despite existing measures aimed at reducing beach litter, the 2014 results represent an increase of 135% since MCS began conducting Beachwatch surveys in 1994. MCS would like invite you to take part in this year’s beach clean and survey, taking place from 19th - 22nd September. Details of participating beaches are still being finalised, but MCS would be grateful if you would be good enough to make a note in your diary at this stage. A new report from Bristol-based research company Eunomia has just been published. A Clean Sweep looks at creative ways to prevent littering in the first place and, as such, is a welcome and refreshing addition to the litter debate. NFU has rejuvenated its effort to get sky lanterns banned by encouraging those of us who care about the damage they do to put pen to paper or fingers to keyboard. As you'll know, this, together with the other form of aerial litter - the balloon release - are things we are passionate about seeing being consigned to history. To make your voice heard go to their letter writing campaign page and send a message to as many of the relevant individuals and/or organisations as you can. Zilch also suggests using the WriteToThem website will make that easier. You might also like to add your name as a signatory to Zilch’s forthcoming letter to George Eustice MP on Chinese Lanterns, a letter that points out the inadequate nature to the Trading Standard that was introduced and will be the spring-board for further actions and publicity. Communities urged to roll up their sleeves and get behind a nationwide spring clean in order to spruce up our favourite public places. Communities across the country were today (31 January 2015) urged to roll up their sleeves and get behind a nationwide spring clean in order to spruce up our favourite public places. Local Government Minister Kris Hopkins has announced a ‘community clear up day’ which will take place on Saturday 21 March 2015 – the first day of spring. The minister is calling on people of all ages and backgrounds to come together and lend a hand to tidy up in time for summer. He is joined in this call to action by Environment Minister Dan Rogerson who has given his support to this event. Efforts will focus on city centres, high streets, villages and parks – anywhere that could turn from eyesore to asset. They were both appearing at a Select Committee hearing this week where MPs have been given evidence of how people across the country are fed up with the way litter blights their communities. The latest figures suggest councils in England spend more than £800 million every year on street cleansing. Ministers believe that communities want to take pride in their local area and public spaces. They are encouraging people to make this a fun activity bringing groups together with a common interest as well as freeing up millions of pounds that can be spent on other vital public services. The Department for Communities and Local Government will provide a toolkit of posters and leaflets (http://thegreatbritishhighstreet.co.uk/clearupday) that can be tailored for each community and in the coming weeks it will also bring together great examples of what has already been done to tackle litter louts in local areas. This is a call to arms for communities great and small to help us end this litter scourge by taking greater pride in our neighbourhoods. It is time to roll up our sleeves and bring the broom back out of the cupboard because by looking after our local areas we can help make them better places to work and live. I also urge the manufacturers of items commonly associated with littering – such as soft drinks, chewing gum, crisps, confectionary and fast food – to join us in this day and contribute to the clear up of our streets and public places. A number of them have made supportive statements to the Committee inquiry so I trust many will get involved. Litter has a huge impact on the quality of our streets and public spaces and we all have a responsibility to keep our communities tidy. Government is introducing a charge on plastic bags and supporting initiatives such as the National Litter Prevention Commitment to encourage businesses to reduce litter through improved product design and labelling for consumers. While we have made great progress in recent years, we still need to get to a place where everyone takes responsibility for their own actions and their own rubbish – initiatives such as this help us achieve that by bringing individuals and communities together to take pride in their areas. Litter blights communities up and down the country and the government’s lead with this clean-up initiative is very welcome. We all have a role to play in keep the places where we live, work and play clean and tidy and a national clean-up is a great way to encourage more people to take some responsibility and pride for their environment. Although litter is a very big problem for the UK, there are also thousands of ‘clean up groups’ across the country who we are sure will actively embrace the day and get heavily involved on March 21. This will be a wonderful opportunity for people of all ages, everywhere, to clean up their communities, and show how much pride they have in where they live themselves and, more generally, in Britain’s beautiful landscape. See the community clear up day Facebook page.